The final score does not tell the true story of VMI’s football game against Wofford Saturday. The Keydets held the Terriers, ranked 19th in the latest national polls, without a touchdown for more than three and a half quarters, but Wofford scored a pair late to pull away and eke out a 17-0 victory in Spartanburg, S.C.
With the loss, the Keydets wrapped up the regular season 3-8 for the year, 1-7 against Southern Conference foes. Wofford, fresh off a win over seventh-ranked Chattanooga the previous week, improved to 8-3, 6-2. Though Wofford’s high-powered option offense piled up 325 yards on the ground, VMI kept the Terriers out of the end zone for most of the contest, and after getting a 40-yard field goal from David Martin midway through the first period, Wofford held on to that slim 3-0 margin for much of the game. But with 5:53 remaining in the fourth, Lorenzo Long scored on a 6-yard run, and the Terriers began to pull away. Long finished the game with 111 yards on 18 carries as 13 different players had a rushing attempt for Wofford. For most of the game, however, VMI’s defense was up to the task. After recording 20 tackles in last week’s game against The Citadel, junior linebacker Allan Cratsenberg paced the VMI stop unit again, getting in on 12 total tackles. Senior Alijah Robinson was credited with 11 stops, including 10 solo tackles. Despite moving the ball, VMI’s offense couldn’t capitalize on scoring opportunities. The Keydets mustered only 62 yards on the ground, led by freshman Tyain Smith’s 49 yards on 17 tries. Aaron Sanders caught a pass for the 37th straight game, hauling in seven receptions for 87 yards. Quarterback Al Cobb, returning to action after suffering an injury in the game against Furman, completed 18 of 31 passes for 184 yards and a pair of interceptions. Midway the third quarter, VMI linebacker Brian Lipscomb recovered a Wofford fumble at the Keydet 39 at the 11:39mark and the Keydet offense moved into the Wofford red zone following consecutive pass completions to Sanders (21 yards) and Forlines at the Wofford 15. As Forlines was turning to gain more yardage, Terrier defensive back Jaleel Green wrestled the ball away and was credited with an interception return to the Wofford 28, halting a potential Keydet scoring drive. Wofford advanced the ball on five consecutive rushes by fullbacks Long and Andre Stoddard to the VMI 7 before the Keydet defense stepped up and junior safety Greg Sanders intercepted a Goodson pass in the end zone squelching a golden Terrier scoring opportunity. 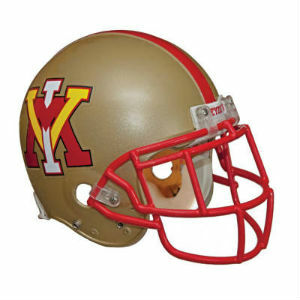 VMI’s ensuing possession was an 18-play,71-yard drive that chewed up 8:35 of the the third and fourth quarter clock but a missed 26-yard field goal attempt by Tommy Smith that would have tied the game at the 12:08 mark of the fourth quarter hit the left upright and bounced away. The Terriers took control and drove 80 yards on 11 plays and broke the tight contest open on the six-yard TD burst up the middle by Long to put the hosts ahead 10-0 with 5:53 left in the fourth quarter. On VMI’s next drive, Cobb took a low snap under pressure and tried to throw the ball out of bounds but his hurried toss was underthrown and intercepted by outside linebacker Terrance Morris who returned the pick to the Keydet 13. Three plays later, Brandon Goodson passed six yards to Nick Colvin, who was blasted by Damian Jones and fumbled the football. But Wofford’s Cole Cleary pounced on the loose ball in the end zone to provide the final margin. VMI was denied its first win in Spartanburg and fell to the Terriers for the fifth straight time in the series. It was the first time VMI was shutout since 2013 against Virginia.